What is Migrations History Table? Migrations history table is a table used by Code First Migrations to store details about migrations applied to the database. By default the name of the table in the database is __MigrationHistory and it is created when applying the first migration to the database. In Entity Framework 5 this table was a system table if the application used Microsoft Sql Server database. This has changed in Entity Framework 6 however and the migrations history table is no longer marked a system table. 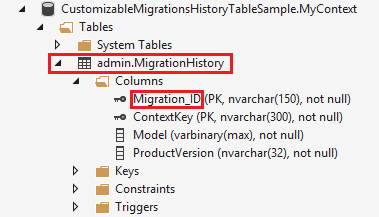 Why customize Migrations History Table? Changing the migration history table is powerful but you need to be careful to not overdo it. EF runtime currently does not check whether the customized migrations history table is compatible with the runtime. If it is not your application may break at runtime or behave in unpredictable ways. This is even more important if you use multiple contexts per database in which case multiple contexts can use the same migration history table to store information about migrations. How to customize Migrations History Table? Before you start you need to know that you can customize the migrations history table only before you apply the first migration. Now, to the code. First, you will need to create a class derived from System.Data.Entity.Migrations.History.HistoryContext class. The HistoryContext class is derived from the DbContext class so configuring the migrations history table is very similar to configuring EF models with fluent API. You just need to override the OnModelCreating method and use fluent API to configure the table. Typically when you configure EF models you don’t need to call base.OnModelCreating() from the overridden OnModelCreating method since the DbContext.OnModelCreating() has empty body. This is not the case when configuring the migrations history table. In this case the first thing to do in your OnModelCreating() override is to actually call base.OnModelCreating(). This will configure the migrations history table in the default way which you then tweak in the overriding method. That’s pretty much it. Now you can go to the Package Manager Console, Enable-Migrations, Add-Migration and finally Update-Database. This should result in adding to the database a migrations history table configured according to the details you specified in your HistoryContext derived class.